Snack Girl makes frequent visits to her local supermarket to check up on the latest. Guess what I found in the shampoo aisle? Peanut Butter and Jelly Sandwich Lunchables! 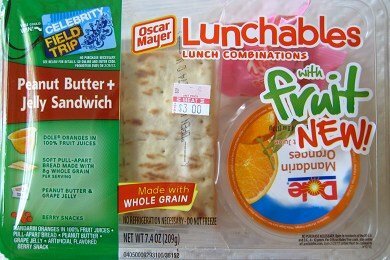 Right there next to shaving cream, toothpaste, and assorted hair products was Oscar Mayer's kid friendly MRE (meal ready to eat) for our children. Now, if we were in a hurricane situation - I would say, "Stock up on those bad boys. They will last forever!" Does the image above look like food to you? 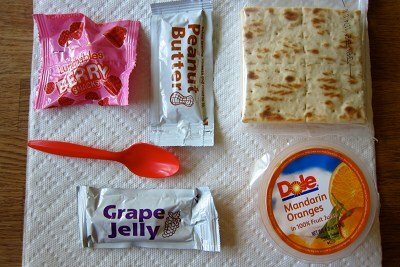 As you can see, it is peanut butter that you must warm in your hand before you squeeze out of the tube, grape jelly, berry snacks, bread, mandarin oranges, and a spoon. 1. Sugar - The sugar content at 37 grams is almost the same as a 12 ounce can of Coke (39 grams). 2. Cost - These cost $3. I know I can make a PB&J with fresh fruit for less than that. 3. Packaging - There is way too much of it and it is not reusable. 4. Not 100% Whole Grain Bread - Made with whole grain flour does not mean whole grain! 5. Artificial colors, flavors and something called "carnauba wax" - I use wax for my floors and car - not for food for my children. These really are the WORST. I like complaining about food like this because I hope it wakes people up to how bad this stuff really is. In addition to whining, we must harness the power of the Lunchable. We can learn a lot from Oscar Mayer's growing sales and lunchable product line. Why are these so attractive to children? Children taste with their eyes - see DIY Packaging Tricks For Healthy Snacks. My kids love little packages and they get so excited with the idea of opening anything - like a present! In a link below, you can see how I created my own lunchable that was far healthier and cheaper than the real version. All I did was use those cute Glad containers that you can find next to the aluminum foil in your supermarket. A little creativity goes a long way when you make your children’s lunch. Please share your creative ideas on kid’s lunches..
Holy crappers thats crazy!!! Glad I make my own lunches!! I think you hit the nail on the head, Lisa. That thing isn't not food; it -- like so much bagged/canned/boxed garbage in grocery stores these days -- is only a food-like product. I think everyone should read Michael Pollan's books, very informative. Will make you think twice on what you eat. Also for the price of lunchables in a long run buying healthier versions of the products and taking 5 minutes to make up enough for the week is a lot cheaper and you will be doing your children a favor. Well that is certainly not FOOD! I don't buy any of that on any kind of basis. We eat whole real foods that come in edible packages. That lunch able is disgusting and it's all marketing. I didn't know that anyone still bought this horrible stuff! Wow! Eye opening but also not too surprising. Processed = junk! Thanks for sharing! I have to admit, I'm a bit confused. What is the difference between this and the Smuckers Uncrustables that you recommended several weeks back? I wouldn't touch either because of the loads of artificial ingredients but I'm curious how one wins over the other. I think you're right, these might be good for the emergency kit. The sad thing is that many children are eating items like these every day and not getting the nutrition they need. I'm looking forward to reading your blog post on making the packaging attractive for the lunch eater that you mentioned; I'm headed there next. Speaking of sugar and such, does anyone remember those desert lunchables? Where it was the pizza crust, chocolate sauce and m&ms? Oh man, I used to love those, haha! I found a very good swap for Lunchables - healthier, and much cheaper. It's DIY stuff, but I like it. I used to LOVE Lunchables as a '90s kid and my mom refused to buy them 99% of the time because she recognized that they are "processed crap!". I recently ate a turkey and cheddar one as an adult and was so excited until I tasted it. It was fake processed cheddar that didn't even taste like cheese. The meat was pretty much mutant. I never thought they were healthy but I naively thought only American "cheese" and Velveeta/Cheez Whiz were the only ones that could be that fake and processed. I now thank my concerned mother =) I really do think that getting kids excited about trendy lunches is all in the packaging and the ability to stack squares of food haha. @Lia -- I was one of those moms that would refuse to buy Lunchables, mostly because I couldn't see spending the money for something I could "make" waaaay cheaper. So, like Snack Girl's DIY post demonstrates, I decided to do up my own healthier version using meats and cheeses bought from our local Amish market displayed in a sandwich box. I'd then add crackers usually spread out attractively (and wrapped in a small piece of plastic wrap so they didn't absorb moisture from the meat and cheeses). I also included either carrot sticks or apple slices or grapes or some other fruit or veggie. And, then I would top it off with a healthy "dessert" such as a granola bar or such. Like you Lisa, I realized quickly that it was all about the presentation. After doing this for a few months, I remember one time that I gave in to the whining and bought some Lunchables because they were on sale for a riduculously cheap price. And, like Lia above, my kids unanimously voted them nasty and never bugged me about my buying them ever again.